Dri X Cleaning and Restoration was a client that came back to us after a year of service through another provider. 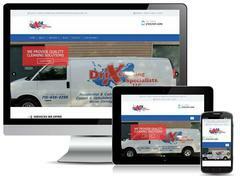 The new website is responsive to fit any size screen and mobile-friendly. On the back-end we went through and boosted their search engine optimization to get them onto page 1 of Google Search Results. Virtual Vision also setup some additional blog advertising and review management software. These tools will help Dri X build their brand online and reach out to their customers who left a review on Google. To view the new website, click here.